Engagement is an important ceremony for a bride as much as the wedding itself and the engagement ring is a precious piece of possession for her, as it denotes the many delightful years that are ahead. 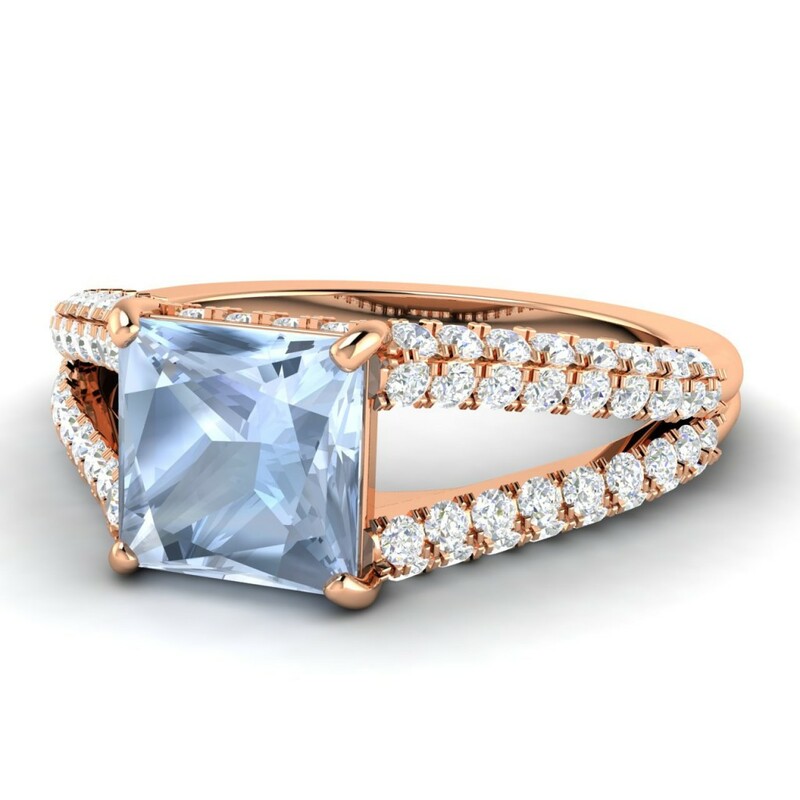 If you are a bride, who wishes to give a special touch to this very special piece of jewelry, you may want to do something different with it, and in that case an aquamarine engagement ring can be a perfect choice. Aquamarine is a unique gemstone which has a pleasant bluish tinge that catches everyone’s attention. 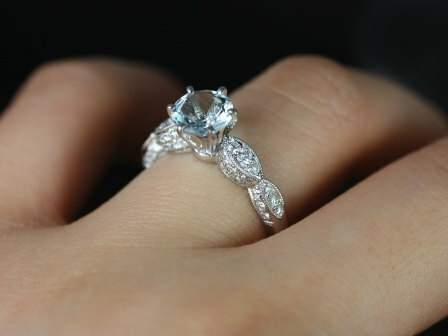 An aquamarine ring can give your personality that distinct touch that you desire as the bride-to-be. So, if you plan for the shopping of an aquamarine engagement ring, here are some points to consider. Aquamarine belongs to the beryl family of gemstones. It is the birthstone of those born in the month of March and is a coveted gemstone for centuries because of its stunning oceanic blue hue. It is also a symbol of eternal youth and its rich azure color is supposed to be an indication of long and happy married life, and so it is apt for an occasion like engagement. A more remarkable feature of aquamarine is it looks pricy and elegant, but it is quite affordable, especially compared to other traditional stones like diamond and ruby. 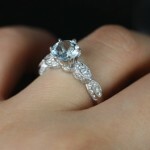 When you start shopping for your aquamarine engagement ring, the band is one of the most primary factors to consider. You will come across many types of bands regarding sizes, colors and metals. It is a good thing on this gemstone’s part, that it suits apparently any type of metal. Normally the preferred metals for engagement and wedding rings are gold, silver and platinum. While going the traditional way and choosing a gold band, you can choose between yellow and white gold, and 14, 18 and 24 carats. Gold band can lose its shine after prolonged use and in that case, you may want to choose silver or platinum. Both these metals are extremely hard unlike gold and won’t bend easily, however silver loses its shine. Platinum is the best choice if you want your ring to look as bright and shiny as a new one even after many years, because platinum is a very hard metal and doesn’t lose its shine. It is also very suitable to those who are allergic to other metals. Synthetic or Natural? – Nowadays many gemstones are being produced in laboratories, making them easily available and therefore, cheaper. But in case of an aquamarine, you need not go for a synthetic version, as the natural stones are quite abundant and affordably priced. Other Gemstones Mistaken for Aquamarine – While you think buying an aquamarine for your engagement ring, you should remember that many other gemstones are often mistaken for aquamarine. If you want a genuine aquamarine, know about those other gemstones. Brazilian Aquamarine: This is a common name used for blue topaz, though sometimes it can also mean an aquamarine originated in Brazil (a leading producer of the stone). Siam Aquamarine: This is not actually an aquamarine in any sense, but it’s a heat-treated blue zircon. Light blue topaz, blue zircon, mass aqua, Nerchinsk aquamarine and aquamarine chrysolite are some other gemstones which are commonly mistaken for aquamarine. Heat Treatment – Aquamarine is commonly heat treated to increase its clarity and color. Natural stone is lighter in color and is more greenish, so a natural aquamarine can be much pricier than its heat-treated cousin. Clarity – Aquamarine is closely related to emerald, but has much less flaws. 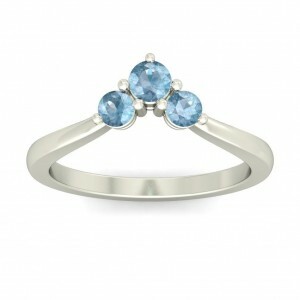 Therefore clarity has little effect on the price of aquamarine. 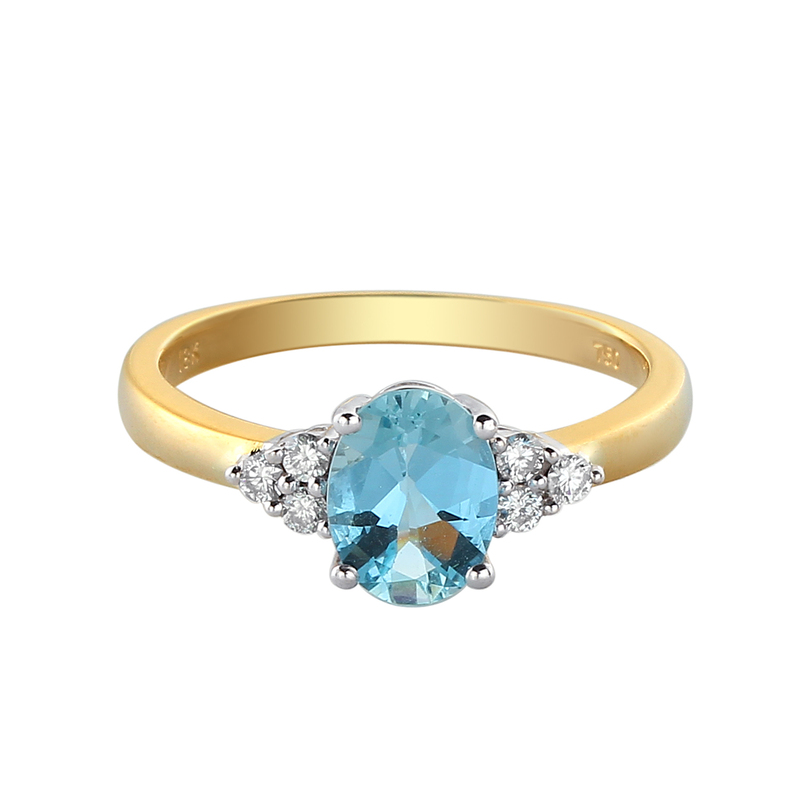 Color – Color of aquamarine can hugely affect its value. The most valuable variety is of deep blue color and is commonly known as maxixe. Carat – Aquamarine of large carat weights are quite common and though are pricier than smaller weighted stones, are not as unaffordable as the more expensive gems like diamonds. With this much information on aquamarine, you can easily decide which aquamarine engagement ring will be the most suitable to your dream occasion. So, choose one and flaunt it to welcome the upcoming happy moments.